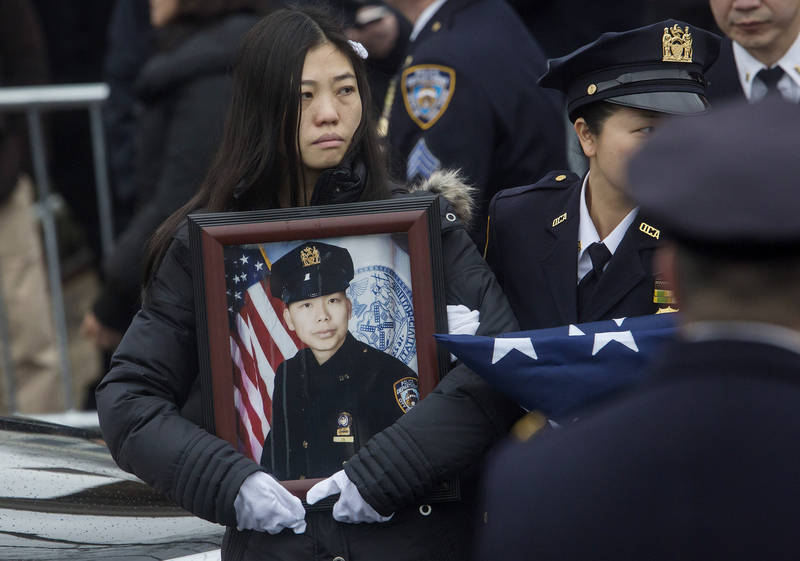 On Sunday, Officer Wenjian Liu was laid to rest. For the second time in one week, thousands of police officers, many from New York City and some from states as far as California, lined Brooklyn blocks in their finest blue. And for the second time in one week, hundreds of NYPD officers silently protested Mayor Bill de Blasio, turning their backs despite calls from Police Commissioner William Bratton to leave the anger, frustration and disrespect at home. As de Blasio began his eulogy for Liu, the slain officer who was murdered along with colleague Officer Rafael Ramos in an ambush on Dec. 20, police officers watching the funeral outside began turning their backs, according to eyewitness and social media reports. Although the symbolic protest wasn't as widespread as it was at Ramos' funeral, the public display once again underscored a rejection of leadership by the city's rank-and-file police officers. In a carefully worded plea issued on Friday, Bratton advised his police force to "honor the decency" of their uniforms at Liu's funeral. The police commissioner, who has publicly backed de Blasio during this time of unease in the city, criticized his rank-and-file officers for stealing "the valor, honor, and attention that rightfully belonged to the memory of...Ramos’s life and service" by protesting the embattled mayor at the slain officer's funeral one week ago. "A hero's funeral is about grieving, not grievance," Bratton added. The number of rank-and-file officers who turned their backs to the mayor is unconfirmed, with some reporting hundreds. However, Associated Press reporter Jonathan Lemire said on Twitter it was more like "thousands," yet most of the protests were kept away from the funeral home. During his eulogy on Sunday, de Blasio alluded to the ongoing feud between City Hall and the New York City police force, which is the largest in the nation. Although the police unions have backed away from using inciting language, including the infamous "blood on his hands" sound bite perpetuated by Patrolmen's Benevolent Association President Pat Lynch, relations between the officers and their leadership remain fractured, with a recent meeting at City Hall reportedly going nowhere. "Let us move forward by strengthening the bonds that unite us," de Blasio said on Sunday. "And let us work together to attain peace." According to Newsday, the mayor's office released this statement addressing Sunday's back-turning protest: "Our city and this Administration is focused on doing everything possible to support the grieving families of our fallen heroes." Although the progressive mayor, who won more than 70 percent of the vote, has been accused of anti-police rhetoric by current and retired officers since the non-indictment of Eric Garner in late November, the consensus seems split among the force. The Associated Press reported that de Blasio was saluted by police guards when he entered a Brooklyn funeral home for Liu's wake on Saturday. A small sign of respect — but a much needed one.